If this car looks massive it’s because it is – in every way. At 5200 pounds it’s not exactly a Lotus. But under the hood there’s a whole lot of power: 1350 horses. Conceived, designed and built by Omaha native Tom Cramer in the early 1950s, the Cramer Comet features a number of weird innovative design aspects. First is the chassis which is built out of nickel-steel refrigerator tubing. Then he popped in a 1350hp Allison V12 aircraft engine. The body is styled after a number of standard 1950s designs. Oldsmobile, Buick, Lincoln, and Studebaker design cues can be seen in this car. What I found most interesting is that the windshield is actually the rear window from a DeSoto. 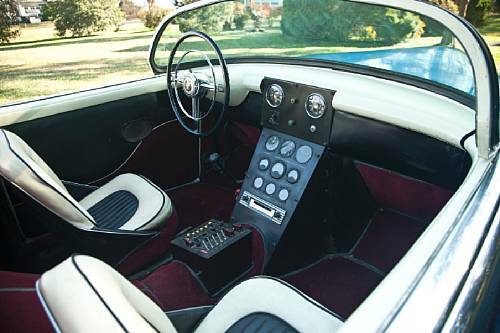 The interior of the car isn’t exactly glamorous but it’s certainly intriguing with the aero-theme continuing onto the dash. It looks to have come straight out of a WWII-era aircraft with function trumping form. The dials on flat, plain-looking black metal. I wonder if it has an attitude-indicator. The car is one-of-a-kind and is being offered for sale from a private collection – the only other owner save for the Cramer family. Pre-sale estimates range from $100,000-$150,000. Here’s your chance to own something completely unique that will blow a Bugatti Veyron away on a dyno. More info can be found here and the rest of Bonhams’ catalog here. 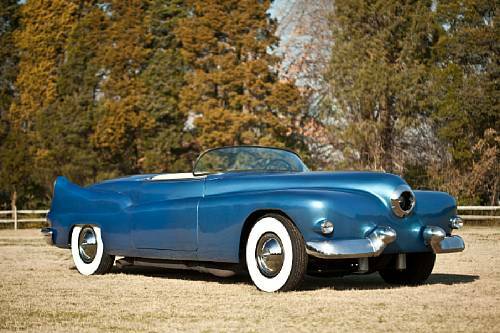 This entry was posted in Uncategorized and tagged 1954, aircraft, auction, Bonhams, car, classic, classic car, comet, cramer, custom, v12 by classiccarweekly. Bookmark the permalink.